This transcript is brought to you thanks to the hard work of Karen Jones. 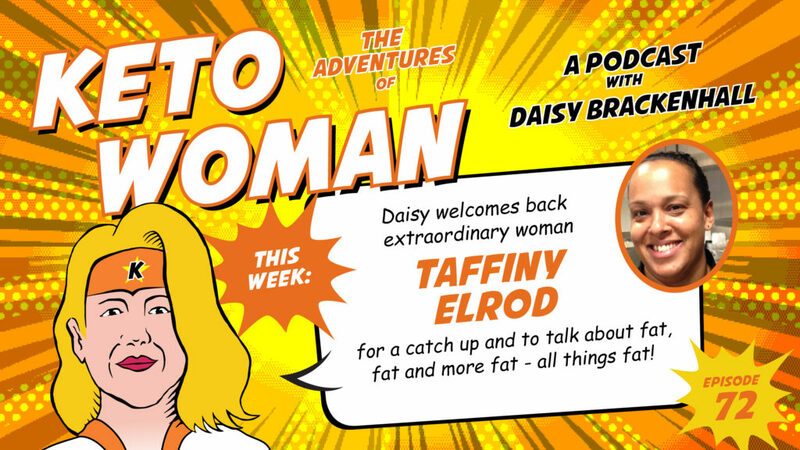 Welcome back Taffy to the Ketowoman podcast. It’s been way too long. How are you doing today? I’m pretty well, thank you. Boy. Oh boy. Well, let’s see. I’ve been busy as always, still running the pizzeria full time and I’ve also been doing some other things which have been fun, so that’s good. I’ve been developing some Keto recipes, a few of them are out there in the world, and working on some projects. Yes. I remember seeing you had you had a recipe out on Have Butter Will Travel’s website. Yeah, that’s right. We did a recipe exchange. That was a lot of fun. They did a really nice recipe with my granola, and this was before the holidays, so I did a sort of Christmas themed recipe, dessert recipe with them. That was awesome. They’re always a lot of fun. They are. And you had a spread in a magazine too, I seem to remember. I shared that on social media. That was very exciting. That was neat. That was fun because it’s a sort of health-oriented magazine that they distribute in grocery stores so it’s free, which was nice. And it’s a resource that the average shopper might just pick up and be thumbing through. It has, yes, and a lot has changed. I should have looked up before we started to see how long it’s been. I don’t think it has been as much as a year, but maybe. But a lot has changed in that time hasn’t it? Yeah, it really has. Yeah, it really has. And, so I did that and that’s still out there. They do it quarterly so if you happen to be near a Kroger store or they have some other store, I can’t remember. It’s called, uh oh, now I’m going to murder the name of the magazine – Nature? Natural Living? Maybe we could share a link or something because it’s also available as a digital download for free. The entire magazine is not Keto, but the feature is Keto. I shared four recipes with them. So that was a lot of fun. And I’ve been developing recipes for Chris and Miriam at Keto Chow. Yes. What was that for? Some new flavored shakes or something. Yeah. So, they have a wide variety of flavors in there. You’re right. It’s a billion. Just for some different ideas what to do besides having a shake, I’ve just been working with that, which has been very interesting. So, I’ve got all sorts of different recipes that I’ve sent over to them. They keep sending me new flavors and I keep sending them new recipes, so that’s been good. Just things along those lines, just been doing some recipe work and I’m still out there on Instagram and around on the worldwide web. Probably some other things I can’t remember right now, but you know, always busy, busy, busy. Which running restaurant is more than your typical sort of full-time weekly hour load, isn’t it? About 80 to 90 hours a week, each of us, both of us. So yeah, that’s crazy. 80 is a good week. Do you ever have time to sleep? I do a little sleeping. Not as much as I should. But you know, we get a few hours in there. The problem is I come home from the restaurant and I want to do other things so I don’t want to go to sleep. I’m trying to steal the time back and I try to work on other projects or whatever. So, right now I’m stealing time from the restaurant – I’m home doing this instead of at the restaurant even though we’re heading into the weekend which means there’s a lot to do. So, I’m always just stealing time. I’m trying to take a little from here or a little from there too, you know, make up a little extra. Yeah. But I refuse to give up. Are you going to manage to get away to any conferences this year? We’re going to see you at Ketofest, I believe. Oh yeah. I’ll absolutely be at Ketofest. I should be doing a demo again this year. I am 90% sure I’ll be at Ketocon as well, in Austin. I’ve been both years to that as well. And that’s become sort of just a vacation almost, like a girl’s weekend. I just go and meet friends there and eat as much barbecue as humanly possible in the course of three days. I have seen the pictures of the barbecue there. It does look amazing. Is that the month before Ketofest? Is it in June? Yeah, the first year. It was actually later, it was in September. But now it’s held in June. So yeah, mid-June, I can’t remember the exact dates. I’ll be doing that, I’ll be at Ketofest, other than that, I’m not sure, I don’t have any plans. I’m not going to be able to do Low Carb Denver or I’m not going to Majorca, unfortunately. That’s definitely on my wish list that one, it looks amazing. Closer to me as well. So, what are we going to talk about in this episode? Well, I thought that since we are in fact on a Ketogenic podcast talking about ketogenic living, maybe it’s time we just talked about good old fats. One of my favorite topics as a chef, pre-Keto, and obviously one of my favorite topics as a keto chef. And I think still a, if not maligned, still a very misunderstood element in the kitchen. Maybe a misunderstood element as a macro too, but definitely not fully appreciated in the kitchen. Too many people have eschewed fat for too long to really understand all of its full beauty, and full applications, and how many cooking fats are out there, that almost everything comes with a fat, and ways to utilize those and enjoy them and celebrate them. Yeah, so explain a bit more about that. Are you talking about maybe how some people may be used the wrong fats for the wrong things or just not using them enough? Where are we going with this? Where should we jump in? Of course. I can see, and this is something I’d certainly like more information on, the different ways to use some of the different fats. I’m sure there are things that I just haven’t thought about that would be a great way to use some of those fats. Because I’m certainly someone who drains a lot of that fat off, not all of it, I do like to keep some in there, but I don’t want to eat something that’s literally swimming in fat. I have my different jars: I’ve got my bacon grease jar, and I’ve got a beef fat jar, and I have my chicken fat jar. I always tend to get less from the chicken, but I have my little chicken fat jar and that for me is the one I like the most. That’s the one I like the flavor of most, I like to put some of that on top of a steak, I think that’s a delicious, delicious flavor, you know, yummy. But like you say, these are effectively free fats and a lot of people, I see them, they spend huge amounts of money on a jar of beef tallow from somewhere or other where I’ve collected it in my fridge. Mine often actually is slightly flavored because I’ll have been cooking the beef with some spices or something, so I have this sort of beef fat that’s got some chili spices in it or something. But perhaps you could just tell us a bit about the collection of these, the storage and then what we can do with them. I do too. I always call it stock. I’ve always called it stock. I actually have a bone bag in my freezer. Because it’s just me, I live on my own, so I’ll eat a couple of chicken thighs or something and there’s just two tiny little bones and you think ‘well there’s nothing much I can do with that’, but I just have a bag that gradually fills up with those. It has the odd lamb bone or the bone from a pork chop. The beef bones don’t tend to find their way in there actually because I tend to cut them out before I cook the meat, which I know you’re going to wince at because I know it tastes better when it’s in there, but I tend to give that to the dogs. I buy, I don’t know what the cut is called in the States, I don’t even know what it’s called in the UK, poitrine they call it here. It’s the ribs, so I guess it’s like short rib or something. It’s very, very fatty and it has the long rib bones in. I cut those out and give them to the dogs because they love them and I don’t want to give them to them when they’re cooked. That’s their very special treat. So beef bones don’t often end up in there though I have picked up bones from the butcher for free, which is fantastic. But yes, I just save them up. So I have this bag that just gets bigger and bigger and bigger until it’s a given size. Then I cook that down in the pressure cooker until the bones are soft enough that the dogs can have the bones and I have the wonderful stock. Sorry, I’m rambling and I interrupted your stock/broth discussion. No, no, that’s all right. Because you’re talking about what I’m talking about and technically there is a difference between broth and stock. I’m not exactly sure when the term bone broth came to be so popular, but it’s a bit of a misnomer. So stock is made from bones and is generally not seasoned. Broth is made from meat. It can be on the bone, but it should include some meat. So, if you used a whole chicken for instance, that would be a broth and broth is seasoned and flavored. Right. I see. I knew that there must be a technical difference. So stock is really the thing that you’re making with the stuff that some people throw away, whereas a broth is making something out of the bits that I usually eat off first. Yeah, because you tend to consume it on its own, so it does have to be a different thing. Because, I must admit, I’ve always thought, yeah, I don’t really fancy just drinking a cup of my chicken stock. I mean it’s okay, but I’d rather make a soup with it. I tend to put it in when I’m slow cooking some beef or something, I’ll put some stock in and you just get this wonderful end result. But the thought of just drinking it on its own is ‘meh’, you know. No, I got that. I don’t think anybody really enjoys that idea. So of course now we’re adding aromatics or adding flavorings in theory if it’s a broth and it also has some sort of actual flesh in it to flavor it. So, going back to the stock and going back to the bones one of my absolute favorite fats to work with is marrow bones. If you have beef bones that you’re using, these would be shanks, bones that you’re using to make your stock or your broth or whatever you choose to call it. I see that people are putting them in there whole and you know, just skimming off whatever comes out of there and keeping the broth. If you roast those bones first or if you extract the marrow first, we usually roast them, the marrow, of course, is one of life’s greatest delicacies. It’s also in theory, perhaps one of the first animal foods that humans ate. Because other animals, imagine a lion taking down a zebra or whatever would have been the animal, and once the carcass is clean, there’s one thing left that most animals can’t access that a human being with a tool can access, and that would be the marrow left in the bones. So, it may be one of our most formative foods, and of course it’s unbelievably rich in fat and nutrients. It’s the storehouse where the blood cells are being made, that might not be exactly scientifically correct, but I think you get my gist. It’s delicious. It’s very digestible, it’s very healing and healthy. So instead of putting that into your water and cooking it where it’s going to be lost, you reserve it. So if you roast those bones first, even if you don’t want to eat the marrow, some people don’t enjoy the marrow, that’s okay. But the fat that comes from them is remarkable, it’s incredibly clean. It’s very clear. It’s very mild. It has virtually no flavor. So if you’re a person who doesn’t like the flavor of animal fat and I understand, I know you’re out there and after years of being a vegetarian, being raised vegetarian, there are certain animal flavors that I’ve still not totally come to terms with, but that fat is totally mild. It cooks beautifully and you won’t get a lot, but what you get is worth its weight in gold for something as simple as cooking an egg, sautéing a dish where you maybe don’t want a lot of flavor from the fat itself. If you want to sauté a delicate vegetable, something like that, it’s beautiful. You can get, depending on the bones, a couple of ounces, a few ounces, it’s so worth it. Then with a little coarse sea salt on the marrow, you can eat that with a spoon if you’d like, or you can use it to enrich your sauces or enrich other dishes – it will give a sort of a somewhat thickening effect, but also a very velvety, silkening effect to a sauce or a soup. It’s a traditional ingredient in a risotto Milanese. If you make that, let’s say you make a cauliflower risotto, it is a much more elegant way to add some richness to it versus a cream cheese or something like that. And then you’d make your stock – it’s the elegance of it that just moves me in the kitchen. This is where we’ve come from, that’s our origins, and that’s what food is. We tend to forget we live in the modern Western world, most of us live in the sort of artificial bubble of food glut, there’s too much food, there’s always food, there’s lots of food. If you turn it around and you look at it from the opposite direction, you imagine being constantly in need of food and constantly working to find food and constantly on the lookout for food – that is the truth of most of our reality as human beings, as a species. Then you can see the basic usefulness of these sort of practices and the elegance of them, especially if you’re coming from a background of the sort of naturalistic way of surviving or feeding yourself from the land, and if you’re Keto. For instance something like a preserved meat like bacon, that’s fat and salt. Well, if you are in Ketosis and you’re on a ketogenic diet, what do you need? Fat and salt. So you’re preserving a food for later use, and it also happens to have this beautiful synergy that it’s exactly what you need and it’s going to preserve you as well. To me that means that it’s correct, I don’t have to guess, I don’t have to say ‘Well, is this is okay for me? Should I eat it because I don’t know? Is it canola oil? Is it this or that?”. No – people have been doing it for thousands of years. It seems to have sustained them and it seems correct. I don’t have to worry about the bacon going bad in two minutes or two days or what have you. So obviously I can go on at length about this, that elegance and that synergy. I think if you’re confused about the food you’re eating, besides asking yourself “How do I feel when I eat this food? Does it make sense? Is it simple enough that almost anyone could do it with almost any equipment if you have a rock and a knife, for instance?”. That’s what I’m talking about when I’m talking about the fat. I have a recipe that I did for my cooking classes last year at Ketofest where we seared duck breast, and you cook it slowly the same way you would a piece of bacon – you start with a cold pan, you use low heat and you allow that fat to render off and render off and render off. From one duck breast, the amount of fat you will have afterward is almost unbelievable. It seems almost physically impossible, like there wasn’t that much and there to begin with. It’s very giving isn’t it? Yeah. It is! And again that fat is beautiful. And don’t forget, all fats function differently. So duck fat, even cold from the refrigerator is soft and spreadable unlike beef tallow which is, even at room temperature, very hard. Coconut oil stays very hard. So, depending on what you’re using it for, if you’re baking something, if you’re making something that you need to mix it into, it’s going to behave differently. They all have their different uses, like you were saying, they all behave differently. But again, if you’re cooking duck breast, you’re going to just be gifted all this beautiful fat that you can use again and again. And, of course, fat also has anti-bacterial properties, anti-microbial properties, it’s a preservative. We can look at foods like confit, the duck legs preserved in the fat and see that fat has these beautiful life giving and lifesaving properties. I like to look at it that way versus, “Oh, is this the most ideal fat? Is that the most ideal fat?”. Maybe one is the most ideal today and maybe a different one is the most ideal tomorrow. Unfortunately, or fortunately, depending on how you look at it, we’re divorced from the yearly seasonal cycle of our foods. That guarantees us a lot of food security and food safety, which is wonderful. I’m not going to knock that, but it also means that sometimes we’re out of touch with the idea that there’s a best time and the best place for a specific food. Yeah, absolutely. And I know a lot about duck confit. I’m in a duck area in France, so you see a lot of the confit jars and as you were saying. I like the way these things tie together. What I like about the kind of cooking and the kind of nutrition you have if you don’t have much money is that it forces you to get inventive. It forces you to get the very most you can out of every scrap. And, I think a lot of the most exciting recipes are actually born out of that environment. But here, yes, like I say lots and lots of duck. I’m in a duck and walnut area. It’s quite very regional in France isn’t it? And they have their different things. And yes, you see these confit jars. And of course they raised their ducks throughout the season, and then heading into the winter, like you say – there is a timing with these things and with the preservation of these foods, they would slaughter and butcher their ducks. The magret – the breast – goes off, that’s the best bit, that probably gets sold to local restaurants, then they no doubt render down the carcasses and things for their broth and whatnot. But then it’s the legs and the thighs that they confit under all that fat that they’ve rendered down, just the fat that renders out of the legs and thighs itself, and then they pack them into these jars and cover with fat. And then those jars weren’t refrigerated, they were just stored. And because everything was covered in the fat and keeping cold in the winter down in the cellars and what have you, that’s the food that they can pull from when they need it during the winter months when there’s not so much food around. It’s very interesting that, just like you say, that the cycle that follows the with the time of year with what’s available and then getting inventive with how to preserve it with what you’ve got. Right. And if you look at those duck legs, they tend to be tough and somewhat sinewy and not fatty in and of themselves, the actual meat. So that time cooked and then preserved in the fat is also making them more flavorful, more tender, more delicious. So that goes back to that sort of elegant system that it’s all benefiting itself and in turn us. That’s what I am sort of waxing poetic about here, I’m gushing, but that’s what I’m talking about. We like it when you gush. There was something I was going to ask you, just quickly going back to the broth. When you started talking about the bones and the marrow bones. Of course it’s very specifically bone broth that is often cited is the thing you should have. So, when you were talking about the difference between stock and broth, then what is bone broth? Is that a broth that has the marrow in it? Is it something else? Is it just one of these things that’s been fabricated? That’s wheat I mean, the culinary terms that I know and that I understand from school and from teaching are stock and broth, so there is no product called bone broth. What I think bone broth is, is just this new way of reinventing the wheel. You know someone’s going to be upset that I’ve said this, so brace yourself, gird your loins. I’m sure you’re going to get somebody to give me a talking to. They can try. Is it then a seasoned stock? Because if it’s bone broth, that implies that basically it’s stock because it’s just made with bones, it doesn’t have to meat in it, I hope I’ve got that right. So a stock is made with bones and if they’re saying it’s a bone broth, then so effectively it’s a stock, but do they turn it into a broth by seasoning in it, but there’s not meat to added so it’s in between the two. Right, I think that’s what’s happening. It’s sort of this – it’s really stock bones that are now being made into seasoned stock, I think that’s what most people are referring to when they say bone broth. And I think it’s just coming to the nomenclature because so many people are not familiar with the traditional style of cooking and they weren’t making these things at home for the last 30 years or 40 years. It’s just a new name for an old thing, but it’s this kind of funny fusion of it. And don’t get me wrong, I mean, what I’m talking about when I say stock and broth, that’s from a professional culinary aspect. So it doesn’t mean people at home aren’t just lobbing everything into the pot and cooking, I mean that’s what we’ve all been doing for a long time. In the United States they also used to make something or preserve something called pot liquor – as you cooked vegetables, you just kept the cooking liquid from the vegetables and then you would use them in more vegetables or in soup or what have you. Oh, I’ve done that when I used to make roast dinners. When I started off, I would boil the potatoes before I roasted them and then I would have a fair amount of water. Then I would drain those off and put them in the oven, but keep the water. Then I’d cook the carrots in it, and so it would then become potato-y, carrot-y water. Then I’d cook beans in it or whatever. Then what was left, which was reduced right down, went into the meat juices to make the gravy, and oh yeah, the best flavor because you’ve added it all. You’ve pulled as much flavor as you can out of everything that you’ve cooked. Yeah. And you’ve basically, essentially made a vegetable stock. And again, preservation of it would have been important. To conserve and utilize water as much as possible, it would have been important to utilize and conserve the nutrition and the vitamins from everything as much as possible, so none of that would go down the drain, none would go to waste – maybe possibly into the garden or to the chickens or to the pigs, but still the nutritional value is still going somewhere. And that’s what I’m talking about. When it comes to fat, that ability to both preserve and then nourish, is really profound. As far as broth and stock goes. Like you were saying, it doesn’t matter what it’s called. It’s one of those interesting things because bone broth is a term that just gets thrown about so much, it is just kind of interesting to unpick exactly what they mean. But yeah, whatever you call it doesn’t matter, it’s just that lovely thick jelly with a bit of a fat cap at the top, that’s what we’re talking about. That’s right. And that’s what we used to feed that to people who were ill or were weak and needed good nutrition but couldn’t chew or couldn’t eat a lot of heavy foods. It used to be understood as a very healing food, and I guess that is what people have tapped back into – that it’s healing, its soothing, that if you’re having digestive problems, it’s something that you should be able to digest and get some good nutrition out of. So I don’t mean to downplay it or demean it, its just that I find it kind of funny, like where did that term come from? It’s okay. I think it’s interesting to unpick that. But yeah, basically what we’re saying as far as bones go, never throw a bone away before you turned it into something else first. Americans are, have been for quite a while, very obsessed with the idea of no bones. You know, boneless wings, boneless ribs, boneless roast. You’re missing out, you’re missing out on a lot of nutrition and flavor. But it ties in very nicely to where we started about collecting fats and some different things. Absolutely. And I mean, you can purposefully make your own tallow or lard by rendering down, large quantities of fat that you can buy from your butcher. But , we’re talking about just collecting the fat that comes off meat naturally when you cook it. Most people that I know who Keto have a bacon grease jar. So that was the first one that everyone collects. Yeah, it’s, it’s easiest. And basically, if you have been saving bacon fat, then you already know how to render fat. All you need is the low temperature ideally and a little time. Then you have fat and you’re going to render that off and you may have something left in there, you may have some nice scratchings or you may have some nice little tidbits in there. You may have some liquid that needs to come off of course. That’s a big thing – if you want to save your fat, you want to make sure there’s no water or anything liquid in there because that’s the opposite of fat and that’s going to encourage bad behavior from the bacteria. So you want to separate it. But fat rises to the top, right? You can just skim it off or repour off the liquid if you have one of those funny gravy separators. And that’s a good point actually with something like bacon. I tend to cook in the oven and the bacon comes out and then I pour what’s left in. Should we be straining the bits out or could it all just go in? From a preservation point of view, does it matter what goes into that? From a preservation point, you want to strain out the bits, it’s going to last better if there’s nothing in there. You can just strain it through a little bit of cheese cloth, muslin, whatever you may have and just strain out the bits, that will help to preserve longer. You don’t really want something else in it. If I keep my bacon grease, I don’t worry about it. I just keep in the refrigerator, we go through it fast, it’s just the two of us. I cook beef bacon actually, which I think we’ve talked about before, it gives off quite a bit of fat, sometimes a lot, and it’s enough for me to cook our food. Because the average person probably doesn’t need a huge amount of cooking fat, you are probably getting enough cooking fat from the food you cook to continue to cook your food. There is nothing wrong with rendering out your tallow or lard, actually doing that process, if you need more. But unless you’re doing a lot of deep frying or something, you probably don’t. Yes, that’s what I was thinking of actually, for using it for something like a deep fryer. So you strain that off and you mentioned you keep yours in the fridge. I just keep mine next to the stove. My rule of thumb is it depends what your room temperature is. I think the thing with the solid fats is that, and that’s one of the reasons they keep, because they’re in a solid state, they don’t oxidize like oils do, so they stay stable longer, but it depends. In the summer when it gets really hot and that’s turning to a liquid, that’s when I start worrying, that’s when it can turn rancid. I can remember my mother always kept butter in a butter dish, which generally is great. But in the heat of summer where it actually starts melting, that’s when it starts going rancid, isn’t it? And I can always remember her butter in the summer was just always rancid because she refused to put it in the fridge. And that’s nasty. It just doesn’t taste good. Exactly. Conversely, rancid or oxidized fat is one of the least healthy things you can eat, so you don’t want that to happen. I keep everything in the refrigerator because we do all our cooking at the restaurant. So, (A) it’s always hot in there, and (B) I just can’t leave some things sitting out if the health department shows up and is like “why do you have all this bacon fat sitting all over?” – I won’t have a good explanation – “well, because I eat that!”. So I just keep everything in the refrigerator or the freezer almost without exception and I just keep it somewhere handy where I can get to it. Bacon fat from the beef bacon doesn’t get as hard as beef tallow, so I can usually just pull it out of the fridge and still use it. And again, it depends on the fat, but they do behave the same as a coconut oil. If you have coconut oil in the refrigerator, good luck to you using it anytime soon. If it’s out at room temperature, you stand a better chance. So you can just do what you’re comfortable with, but you don’t want to leave it somewhere hot. People have a tendency, they do it with spices too and spices have volatile oils in them that can go rancid, they put it above the stove, that cupboard above the stove, and their cooking oils too. And unfortunately, that’s convenient, but it’s the worst place to put it because it’s always going to be warm there when you’re cooking. And lights as well isn’t good for spices. And you see often it’s that typical spice rack, and they look very pretty, or the different colors, but it’s really the worst possible thing you can do for spices isn’t it? Heat and light. Yeah, exactly. And your oils obviously if you’re cooking with other oils or eating other oils, it’s the same thing. Obviously olive oil doesn’t need to be somewhere hot and it doesn’t need to be somewhere with lights. And if you have nut oils that you’re using, I love to, I don’t cook with them but I add them to my salad dressings, for instance – pressed walnut oil, hazelnut oil, pistachio oil, toasted pecan oil is amazing, or pecan oil if you prefer. Again, those I actually keep in a cool sort of pantry to keep them cool, and it’s dark. But if not, just keep them in the refrigerator. It’s better than somewhere else because those are volatile and those will go rancid pretty quickly and then they’re awful. And it’s a big waste because they’re expensive. They are expensive and yes, they are delicious in things like salad. Walnut oil is something I get a lot here. And quite often with the cheese course here they will serve just a very simple lettuce salad dressed with a little walnut oil, sometimes with walnuts in there as well. And that goes incredibly well with cheese. Absolutely delicious. A typical thing that it comes out with a little cabecou which is a goat’s cheese that again is from this area and the combination is just delicious. There was a restaurant I used to eat in, it was a starter they made, it was these little goat cheese round flat discs and it was coated in something like an egg wash then crushed walnuts and deep fried. And, oh, it was just delicious. This crispy walnut outside and then this lovely melty goat’s cheese in the middle on a salad, just delicious. We’re collecting all this bacon grease and I must admit I’m bad for this. I’ve got two jars of bacon grease and I don’t use it enough. Every day I cook my scrambled eggs in butter. I have tried cooking them with bacon grease and I just don’t like the flavor as much. So I have all this bacon grease sitting around and I don’t use it enough. I mean obviously I do use it when I’m, frying something, but what are some things that we can cook where it’s really going to be beneficial to use it, where it’s really going to add some flavor? I did make the other day, and it really did enhance the flavor, I made some of my seed crackers. And towards the end before rolling them out, I mixed in some melted bacon grease. And they tasted, you could taste it in them, they didn’t really taste bacony but it just had this lovely salty, savory, extra savory flavor to them. And that was really nice and I did feel it really enhanced it. So instead of just kind of using up as this general fry thing, how can we use it to really enhance dishes? Well, you can absolutely use it in baking of course. So whether you’re making almond flour biscuits or just about any sort of quick bread style dish, obviously in the American south you can think of things like cornbread, if you’re making your Keto cornbread, I use it in things like that all the time. I love to cook my vegetables in animal fat, bacon fat is especially delicious. One of my favorite things…when you go Keto, you struggle to have all this fat – “I have butter but I don’t have toast” or “I have fat but I don’t have rice, what am I supposed to do with this now?”. One of my favorite things to do is to sauté mushrooms in whatever it may be. With bacon fat, they absorb and they absorb a lot. And so actually, if you’re trying to figure out how to get some more fat in, eggs will take on a lot of fat like butter or whatever fat you’re using. Sometimes I do my eggs with the beef bacon fat. Sauteeing mushrooms in whatever animal fat you have is delicious and they will really absorb a lot of it. So if you’re thinking ‘where am I going to put all of this?’ – thats one of my favorite ways. Also one of my favorite ways is with a dish that normally where I would have used pasta before, if I make a roast with a sauce or chop with a sauce or something along with potatoes, rice, pasta that you don’t use anymore, a sauteed vegetable, like a mushroom will also absorb a lot of that sauce and be a vehicle for the sauce. So that would be my first thing I would say. And any vegetable that has that propensity to absorb if you’re cooking it, eggplant is another and you can sometimes get zucchini to do that if you cook it in a fat you like. that’s one of my first go to things. I just sort of throw fat into things as I cook. I don’t worry about it – I would put some in the beginning and then I’ll put some more as it’s cooking and then I’ll just throw some more in there, I’ll keep going and sort of see how much it will take on. You get a feel for it as you cook whatever it is that you like to cook. I love, I love sauteed cabbage. I always have, I love sauteed cabbage and that’s something that tastes really good. Yes cabbage really does go well with bacon, doesn’t it? And is it something you can, since you mentioned using it in baking, is it something that you can use to replace, for example, if there is butter in a recipe, can you do a straight swap with using something like that like that? Because everybody is going to behave slightly differently because obviously the butter has those milk solids but I guess it depends a little bit on the recipe. How is it going to behave differently? Could we just do straight swaps? What do we have to sort of watch out for when using it? In some of these recipes where it calls for something like butter. Unless you’re using butter very specifically to mount a sauce or enrich or sauce or something like that, you shouldn’t really be too much of an issue, especially in Keto cooking and baking because it’s not nearly as delicate as something with flour and sugar. So the effects of the butter would be having in something like a biscuit or a cake or in traditional baking is not really going to apply. When you get to talking about things like coconut flour and almond flour and you may need slightly less fat than you would butter. You might need to just very slightly increase your amount of liquid, but you probably won’t. You probably could just use it one for one in Keto baking without even having to worry about it. Again, unless you’re talking about making a sauce or something. And then of course the other obvious place, oh, did you want to say something? I was just going to say, potentially, it’s going to add quite an interesting flavor tone, especially, I’m just thinking of some of the sweet things you could add it to, that It’s just going to add that hint of ‘I can’t really tell what that flavor is in there, but…”, but you can see that it’s adding a layer without, making your shortbread taste of bacon or something. But I can see it being interesting even if you just subbed out some of the butter for a bit of bacon fat adding an interesting layer of flavor. Yeah, absolutely. And it’s fun to experiment, it’s fun to try it and see what, what you get, how it goes. I was just looking at a recipe somewhere that was with spices, bacon fat and spices in a cookie or something like that. You know, don’t be afraid to experiment, I mean, just go for it. What the heck, try. And then of course the other place that we can use our fat is with lean meat. There’s plenty of options for making pates, making tourines, making roulettes where you just combine them. So chicken breast is kind of boring and not very flavorful, turkey breast is kind of boring and not very flavorful. They will absorb a lot of fat and a lot of liquid. So if you grind it and make patties or whatever you want or you make it into a pate, you can incorporate a lot of that animal fat in there. Not only does it taste good, but it makes it something that’s edible. I personally was never a fat bomb person. I don’t enjoy just eating fat in and of itself, unless it’s something like a piece of butter on top of an egg or something. So making it into something that feels more edible, more tasty or more substantive, helps me to sort of enjoy it more. So if you’re making like a simple pate, a couple chicken breasts that are cooked and are boring, you can throw them in the Cuisinart with some duck fat or bacon fat and little seasoning, whatever you like – if you have fresh herbs, great. Then you can eat that and it’ll be a little bit more exciting than just eating a spoonful of bacon fat, unless thats your thing! That’s cool too. Quite good hand moisturizer as well. I was smearing some over my cast iron pan after I’ve washed it out. There was something that had actually stuck to it and I was smearing it over the pan with my hands and then rubbing it into my hands afterwards. Um, smelled a little bacony, but , who cares? It’s Keto. You did mention the beurre monte just a little while ago and perhaps you could just tell us what that is and how to make it. I do faux beurre monte, I think with when, when I have something like if I’ve made a casserole or something, something like a beef casserole and I don’t tend to thicken sauces with any kind of quote unquote flours. I’ve never been a fan of that. The French in general seem to have a jus more, which is much, much lighter isn’t it? And I tend to prefer things a little bit thinner like that. But if I do want to thicken it up, I tend to just reduce it until it’s thicker naturally or maybe add some cream. But what I really like and I’ve always done it with soups, adding it both for flavor and to thicken so I do it with sauces as well, is to add some butter to it. So as it’s come out, so I’m not cooking with it, when it’s come out and it’s in the bowl and it’s hot, I would just add some butter to it and stir it in and it tastes delicious. If anyone’s in any doubt, I love butter, but it also makes this thick unctuous sauce. And I think, beurre monte, that’s kind of what beurre monte is, isn’t it? But there is a process to it rather than just throwing lumps of butter in it at the end. Which is what I do. Kind of a similar end result I think, isn’t it? It’s basically thickening a sauce with butter isn’t it? Well yeah. So there’s an actual beurre monte, which is a preparation of cooking butter with water that then you can hold it for a while and you can add that to dishes as you serve them. , as you finish the sauce on the line. The simplest thing is what you’re saying and that’s mounting with butter or finishing with butter. And if you’re at home, this is what you are probably going to do. So when you have your sauce reduced, for example if you saute a dish in a pan and there’s a pan sauce there – there’s some drippings, there’s some juice, and you maybe add just a little bit of stock or a little bit of wine or whatever if you need to or maybe it’s good enough on its own, then at the end after you’ve pretty much pulled it from the heat, right as you’re pulling it from the heat…add your butter. Your butter has to be not melted, not too cold, but sort of room temperature butter, a little bit on the cooler side, still solid. You just put a couple pieces in there and whisk it in real quick. And what happens is it’s holding, it’s emulsified, it doesn’t completely melt and it gives a sauce, a beautiful velvety, silky richer mouthfeel. It is sort of thickening the sauce or giving it more body. It takes a little practice sometimes to get it right, that you know you’re getting it there, right timing -it’s not too hot, it’s not too cold. It’ll taste good no matter what, it’s butter. And the better your butter is, the better it’ll work. And you can just take a whack at it, just slinging some butter in. You make a chop and add a little liquid to the drippings in there, get it warm and put a couple pieces of butter in and whisk it in. You’ll have a beautiful sauce. It doesn’t hold for a long time. You eat it right away – you serve it and you eat it. But definitely that’s finishing or mounting with butter. And it is delicious and it does make it more filling. You do get some people saying that, oh, you know, fat isn’t a fitting macro nutrient and blah, blah, blah. But I definitely find that with a sauce like that, it limits how much you can eat. Yeah. Oh yeah. And that’s the thing. That’s what I mean. If you’re just trying to force yourself to just eat plain fat, it’s not always that pleasant. You need a way to, you need a fat delivery system to make it feel more satiating and also to make it feel like you’re eating something you made, make it taste better and be more satisfying. Exactly. And I’m not saying to people that you’ve got to add fat. I just do it because it’s absolutely delicious. But if you like things a little bit more on the leaner side, you don’t have to add it. It’s not that you need to eat as much fat as you can because it’s Keto. We’re not saying that. It’s just that I love butter. Yeah. If you’re using ketogenic diet for a therapeutic reason, maybe you do need to force yourself to eat fat more than you really want, and then you need to be creative with how you’re going to eat it. If you’re doing keterogenic diet for weight loss or some other health reason, it doesn’t mean you need to just force feed yourself fat. I just added to things, I add it to lean protein, I added to vegetables or I cook with it or it’s already in there, but I don’t need to eat like a lot of fat or need to force it on myself. I don’t have a need for it. I just make my food tastes good and then I’m done. I leave with that. Yes. I think I definitely need to experiment a bit more with these meat fats that I collect. I do tend to too often just opt for butter. I need to think first before I throw the fat into the pan. Well let’s choose one of the other fats. Yeah, it butters an easy go to and you can mix it up and try some other things and experiment. It’s good. Yeah. And what do you find, cause we have mentioned some, some other fats. I’m not a big fan of cooking with coconut oil. I have to say I don’t really like the flavor in most things. The only time that I tend to use it is if I do want to add that flavor. So if I was making something like a carry for example, and with needing to fry the meat or some onions or whatever, then then I might use it. Yeah, I cook with it some but not a lot. I tend to bake with more than I cook with it. Now you can get butter flavored coconut oil if you can’t do dairy and it’s pretty good actually. I think it just depends. You can force yourself to cook with coconut oil, but for one thing sometimes people overdo it and they upset their stomach right away when they first are using it. And also, yeah, it has a time and a place. So I tend to prefer in sweet preparations where the flavor sort of enhances that sweetness and if I’m making a curry or something like that. But even then I still probably rely more on coconut cream or full fat coconut milk than I do the coconut oil. But everybody’s different. Everybody has a different way of of how they like it. It does work well for frying, but it will impart a flavor. So if you want to make a coconut shrimp and fried coconut shrimp, then you’re in good to go use your coconut oil. But if you’re making something you know that you want a more neutral flavor it, might not be your favorite go to. And all these solid fats, the ones that go solid at room temperature, they really are your best fats for for frying aren’t they? What was your feeling about olive oil? Some people say you can cook with olive oil and some people say you shouldn’t cook with olive oil. I think extra virgin olive oil, you shouldn’t be cooking with it. It’s best used for finishing and dressings and things like that. And then the rest, there’s a long tradition of with olive oil. I mean people do that traditionally in places where they’re producing olive oil. I mean that’s just a fact. But I think to each his own, if you feel comfortable with using a lighter form of olive oil that doesn’t have as much flavor and it doesn’t have as much volatility. So olive oil is similar to butter in that way, it has some food particles in it, it has things in it that oxidize quickly and that burn quickly if you tried to cook with them. But if you’re using a second pressing oil or something like that, and again, I’m not even gonna get into that. There’s people who have very strong feelings about whether it’s poisonous or whether it’s not okay. And again, I think this has to do with industrial food complex. If you have your own olives and you’re producing your own olive oil, then you probably know what you’re getting yourself into and you can judge when you’re going to cook with it and when you’re not. If you’re buying premade olive oil, then you don’t know how it’s been processed and you don’t know how that oil has been extracted from the olives. The first pressing the oil is coming out of the olives, everything after that, it’s the sort of slurry of the pits and whatever’s left from the olives, the paumice. Whether you feel comfortable eating that or cooking with it is up to you. If you do use that paumice oil or like a light oil that doesn’t have that volatility to it, you can cook with it. Not at high temperatures. I wouldn’t say frying it, but you can saute an egg in it or something like that. It’s doable. I do some of both. I eat it. I love extra virgin olive oil and I will put it on everything and I can even drink it. I could drink a spoonful or a shot glass full of it. Um, which is said to be good for an ulcer. If you do that on an empty stomach first thing in the morning. Yeah, supposedly that will heal an ulcer. I don’t know if that’s true, but it kind of makes sense if it’s, if an ulcer is in fact bacterial, but I have a lighter olive oil that’s not an extra virgin olive oil that I will use sometimes in cooking too or where I want, not the strong flavor. I’ll use olive oil to make garlic butter. I’ll mix it with the butter so that it stays spreadable, that sort of thing. I must admit I do use it and I have used it for frying, although not at a super high temperature. But the, the reason I pick it, if I pick it, it’s for the flavor. So if it’s the dish I’m making that I’m firing a component of it, it’s for the flavor that that is adding to it. But I’m always slightly aware that potentially I shouldn’t be frying with it. I think we’ve pretty well had quite good turn around the fat and oil cabinet. You mentioned earlier about some of the really tasty nut oils and things and I think that they’re definitely something to explore. Aren’t they really interesting to mix into dressings and finishing off foods and often I think it’s nice if you’ve got an an Asian dishes just to finish off with a bit of sesame oil or something like that. It just really lifts it, doesn’t it? And that’s, that’s like kick at the end. I honestly think of it as a way to sort of really treat myself or really indulge myself. If I see a really beautiful, unusual oil, that might be a little pricey. It might be a nice fancy bottle, I’ll buy it for myself almost the way you would buy yourself a French perfume or something. I really feel indulgent, and that’s how I use them. Truffle oil, pistachio oil. I love toasted sesame oil. Get the best quality you can for yourself, and then you use it as this final touch of magic. It doesn’t take much. They’re very flavorful. They’re very aromatic and they add this extra layer of flavor that’s almost, it’s sort of, it elevates things, but , he’s like, you almost get “What’s that? What’s in there?” But it just tastes so good. And , especially if you’ve changed your way of eating and you’ve cut back on the amount of additives that are in your food and you feel like you need some flavor or excitement, just a teaspoon or a couple of drops of an oil like that will really add another whole level of flavor. And they’re just so interesting and delicious and exciting in my personal opinion. But like you say, especially as these things are expensive, it’s just important to store them well. So if you haven’t got a cold, dark cupboard, it’s best just to keep them in the fridge. Yeah, keep them cold. You can even keep them in the freezer. , if you really going to keep them because of course the refrigerator is full of moisture, which isn’t always great for your oils. Um, something that you really want to keep. You could even keep it in the freezer. They will stay liquid. Even in the freezer they’ll remain semi-liquid. So just a moment or two out of the freezer and you should be able to use them. It Is not necessarily ideal, but it might be better than keeping them in a moist refrigerator that’s always being opened. So your best bet is a cool dry, dark pantry or cellar type area. I’d really love to live in a house that had the old fashion Pantry with the big marble slab. Lovely. Cool. Yeah, there’s really something to be said for a pantry. Oh, that’s very nice! And I’ve missed you. It’s, but it’s just nice to catch up with you. It has. It’s been really nice. Well, perhaps you could leave it with a top tip. Well, I think going back to what I said earlier is, my top tip for the kitchen and your Keto kitchen is don’t be afraid to experiment. And with your fat, don’t be afraid to experiment, throw it into something, go crazy. , lighten up. And that’s, I guess it applies to life too, but as a cooking teacher and a person who’s cooked for a long time, I see a lot of people who are afraid that they’re going to have to throw something out or it’s not going to be perfect. Or they’ve learned from television that, the only food that’s worth eating is the perfect food. My husband always asks me, he’s like, why do people think everything you eat has to taste delicious? It’s like, food is food, eat it. I was like, that’s an interesting question. I’ve never quite, I’ve never thought of it that way. Don’t be afraid to experiment. That’s how we learn. That’s how you learn the best lessons in the kitchen – your failures. You always learn more from your failures, but you also create something new instead of being the person who just follows a recipe, you will become a cook. You will learn and you will have your own signature dish and it might be a signature dish with that almost burnt butter, or something like that. It’s okay. So just don’t be afraid. It’s very rare, isn’t it? It’s very rare that something goes so wrong that it’s inedible. And I mean, in that situation, that’s what dogs are for anyway. Sorry, so it never goes completely to waste. Get yourself a dog and get in the kitchen! I’m always reminded, my mother used to make fudge a lot when I was a kid and I mean, it’s just delicious. It’s just sugar and butter and cream isn’t it? But, one year, it used to be something, she made it at Christmas. She didn’t make it all the time. It was a Christmas thing. So we made it once a year and one year something went wrong. And I’m not quite sure what, because it has that quite long process, doesn’t it, where you have it just sort of lightly bubbling away with the thermometer sticking out and till it gets to the right temperature when it makes that, what’s it called, when you can make a little ball out of it, isn’t it cool? Yeah, soft ball consistency, I have to get it to this soft ball consistency, but it’s a certain temperature and all the rest of it, I think probably, and then it comes out and then you have to beat it with the beaters. Essentially get a bit of air into it. And that’s your finished product, the fudge. Something went wrong. I don’t know what it was. I think probably it got a bit too hot, but somewhere between it getting too hot and then it beating it went into this weird kind of almost like blown, like honeycomb does almost like that but it wasn’t, that you put bicarb in. Yeah, the heat probably went too high. But it went to this like these crunchy crispy bits that were delicious. But could she repeat that? Because then because we are all, this is amazing. Make this again. But of course you couldn’t, you couldn’t recreate it because it was just this wonderful mistake that that never happened again. So sometimes that happens, occasionally it’s for the dog, but sometimes is four wonderful surprise that something completely different. No, I absolutely agree with that. I think, I think experimenting is good. And, and I’m, a shocker actually, I’m good for never following recipes. I always experiment and make something different. But that’s what I enjoy. And it it should be fun, shouldn’t it? Cooking and feeding yourself should be enjoyable. It should be. And my students used to do things that I thought were wrong, so I wouldn’t think of doing them – no, that wasn’t right! And they would come up with these interesting new flavors or concoctions that…you know what? It wasn’t correct in theory, but the end result was really good or really interesting and yeah, so just don’t be scared. Go for it. Who Cares? Crazy. Well, thank you so much for giving me some of your very precious time. I really appreciate it and it’s been a great pleasure. Thank you so much Daisy, and thanks for your technical support.